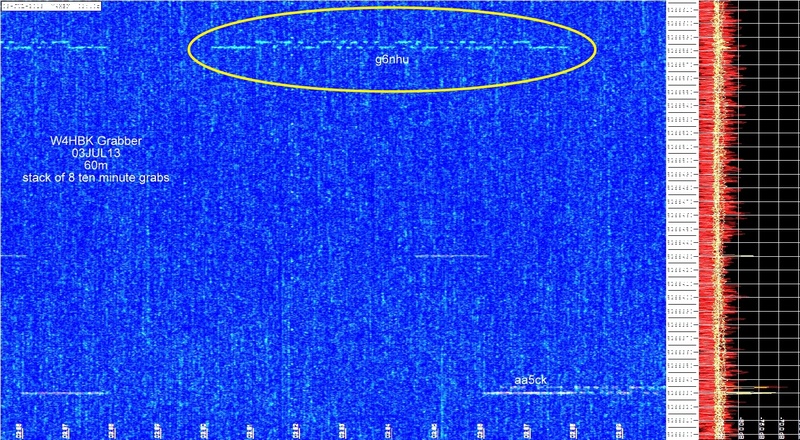 The 60m band is fairly new amateur radio allocation, first introduced in 2002 but only to a few countries such as the United Kingdom, Finland, Denmark, the USA, Ireland, Iceland and Norway. I had an experimental Notice of Variation for 5 MHz on my licence a few years ago and I renewed it when we were allocated some different frequencies earlier this year. I’ve been very keen to try some low power experimentation on 60m and when Hans introduced a low pass filter addon for the Ultimate 2 transmitter for 60m, I ordered one straight away. I assembled it on Monday evening after my family had celebratory curry and bottle of champagne – I’d just started a new job so it seemed appropriate. But I digress! 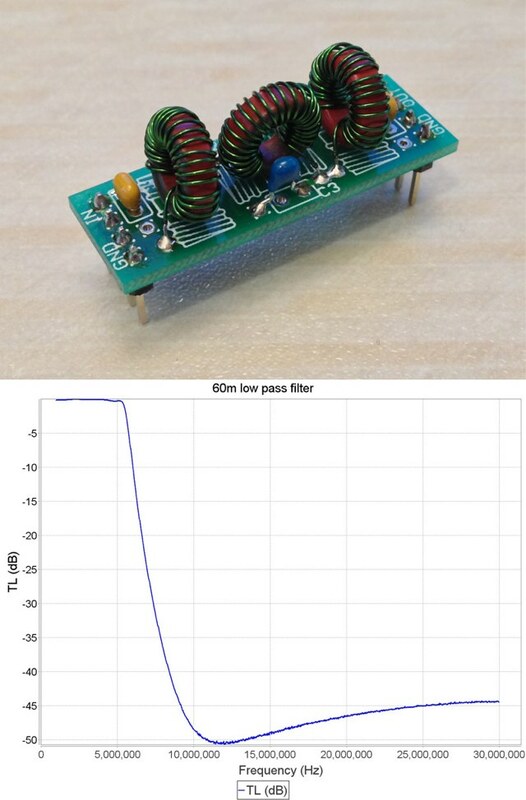 Here’s the assembled filter and the frequency response plot. Looking good. 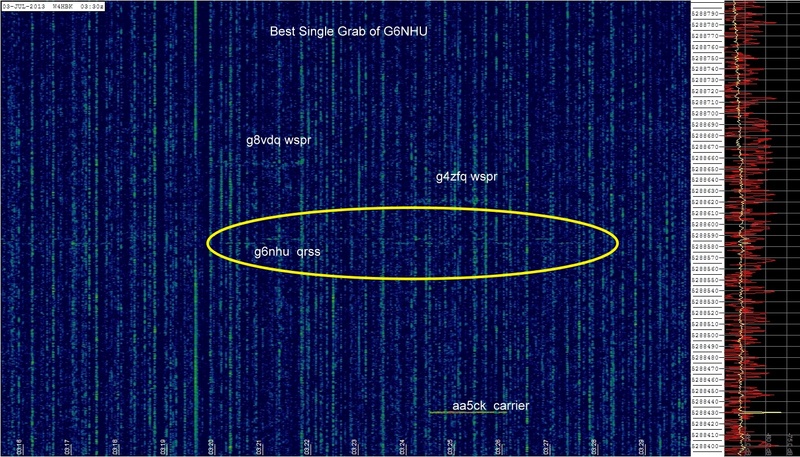 There is a slight problem with running QRSS on 60m though – The frequency allocations around the world vary vastly from country to country (see the allocations here) and so choosing a frequency to use would be a minor challenge. 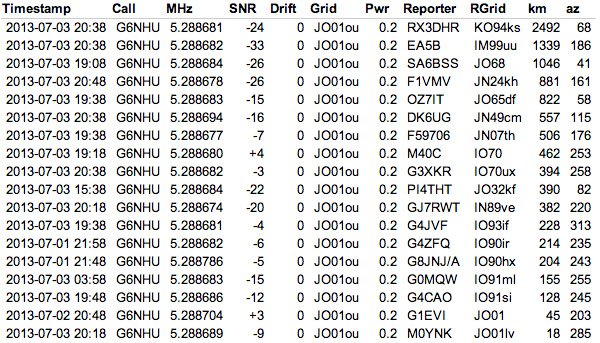 In the end, on the advice of Bill, W4HBK I decided to drop in directly below the frequency listed on the WSPR site so that people could monitor both WSPR and QRSS at the same time. Not everyone in the world can transmit there but that doesn’t stop people setting up grabbers to monitor for my signal. 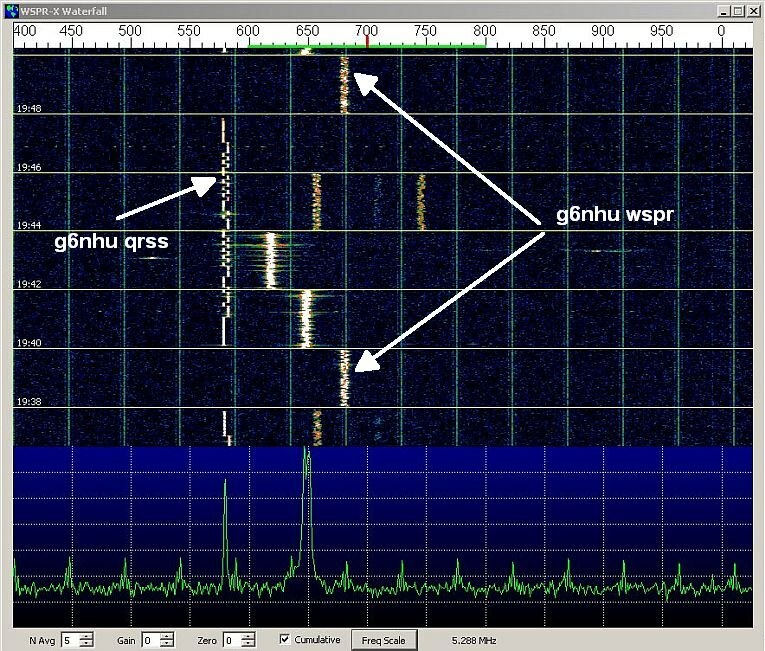 I posted on the Knights QRSS email reflector that I was going to run QRSS on 60m for a few days and would appreciate reports from any stations who were able to see me. 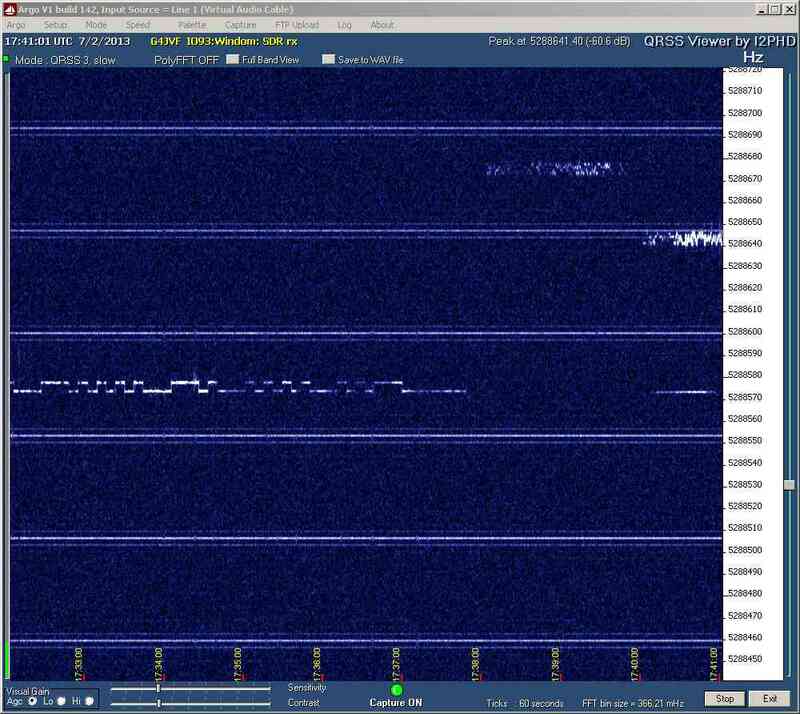 As the U2 kit supports WSPR as well, I fired up both WSPR and QRSS at the same time. 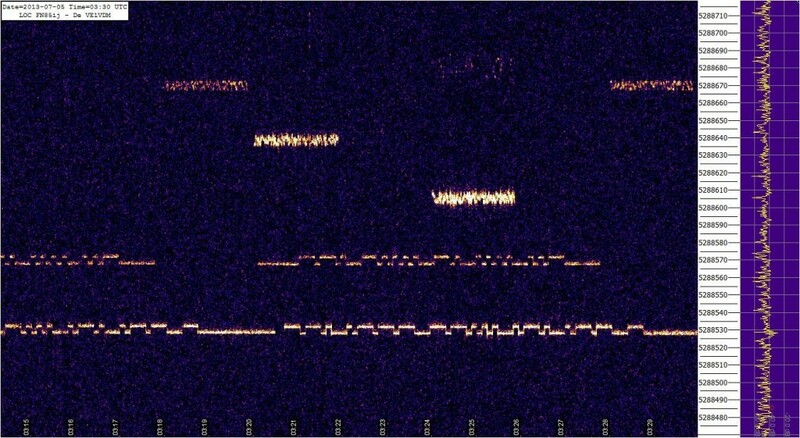 I was very pleased to see a number of QRSS grabbers QSY to 60m to look for me and here are the captures I’ve seen so far in order of distance. I’d like to thank all the grabber operators who moved over to 60m at short notice for my tests. Without these grabbers, there would be no point in transmitting QRSS. Thanks guys. I’ve had a few more spots on WSPR which doesn’t surprise me. Here is a list of the stations who have heard me on WSPR since Monday. I’ve been keeping an eye on the WSPR spots and largely they vanish for a few hours during the middle of the day as band conditions change and then come back in again as the afternoon lengthens into evening. WSPR is a great way to see what’s going on and watch conditions change. However I was really hoping for a spot across the Atlantic into north America. Bill, W4HBK has been watching for me and last night he was able to see me on his grabber. Here’s the best single image he received. You’ll have to click to get the full size image as it’s not really visible when scaled down. Bill also stacked eight of his ten minute grabs and they show my signal much clearer. Again, click the image for a full size version which shows the capture better. 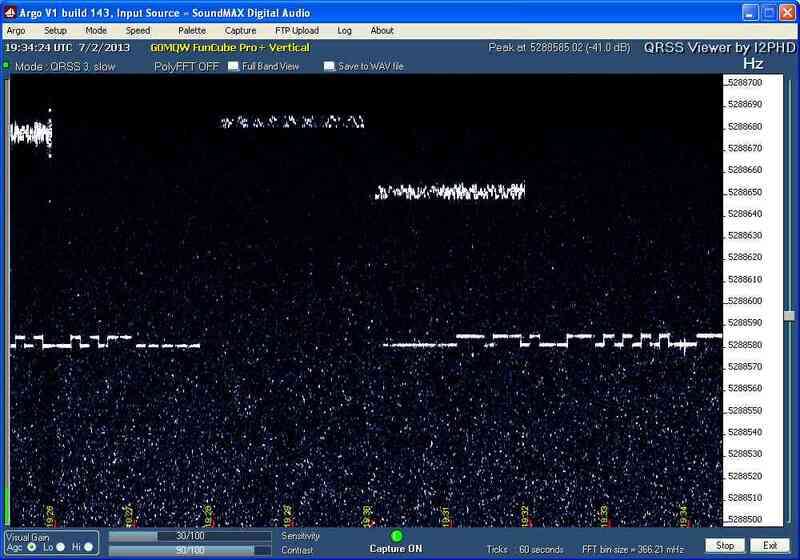 There are two other stations UK visible on the first capture. G8VDQ is running five watts and G4ZFQ is running one watt. 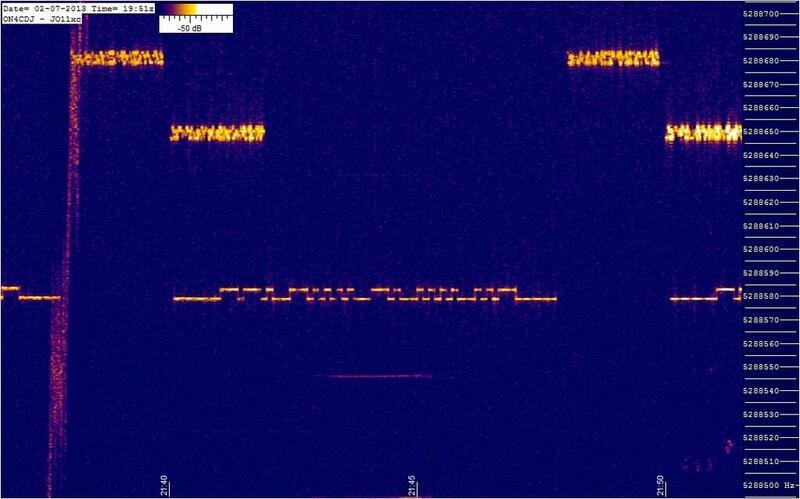 My WSPR signal was visible on a stack but not decodable and so I’ve not shown it. However my transmitter is running just 200 mW output with 20m of RG213 feeder, an SGC Smartuner and then 8m of 450 ohm open feeder to a random length doublet. 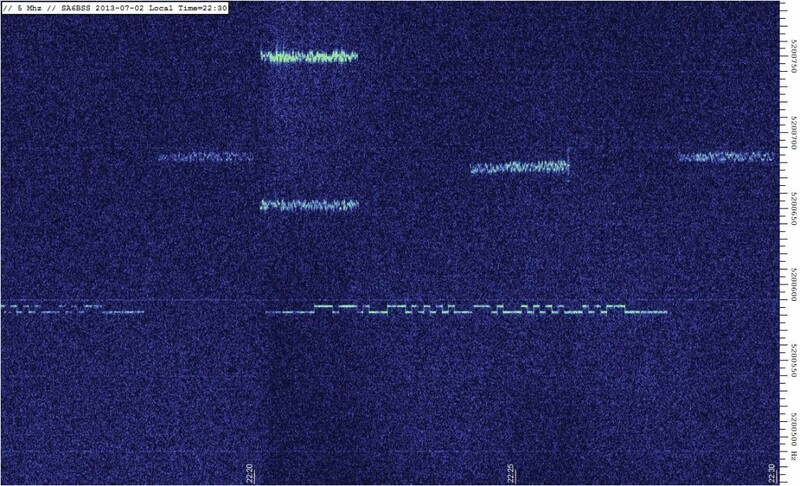 Both Bill and I think this is the first time that QRSS has been experimented with on the 60m band and as a result, it’s the first time that 60m QRSS has been received transatlantic. 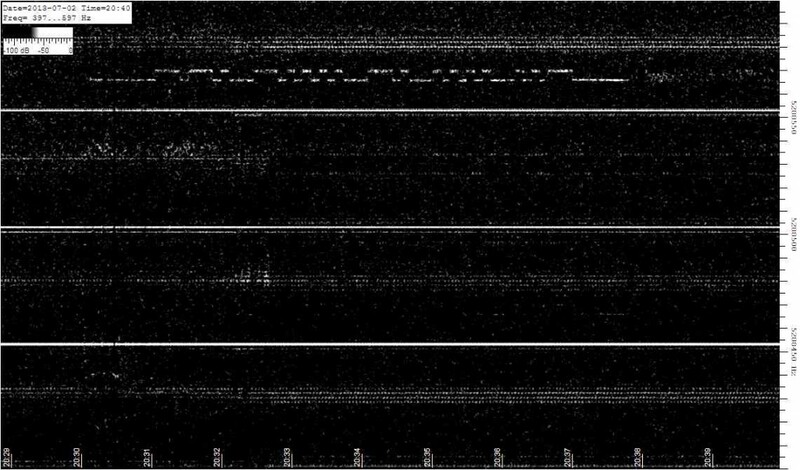 Two days after my original post and I’ve had another spot across the Atlantic, this time from the ‘Big Ears‘ grabber in Nova Scotia operated by Vern, VE1VDM. At the same time he also spotted Andy, GJ7RWT who moved his MEPT to 60m as well. 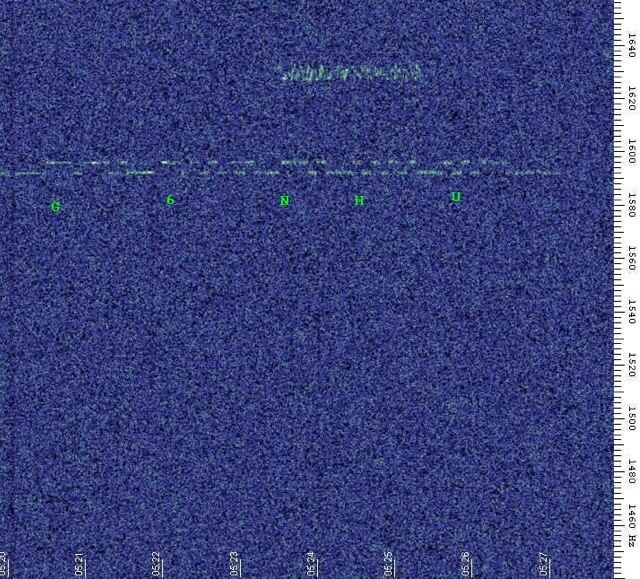 This is a single image, not stacked and you can see that both our signals are nice and loud. 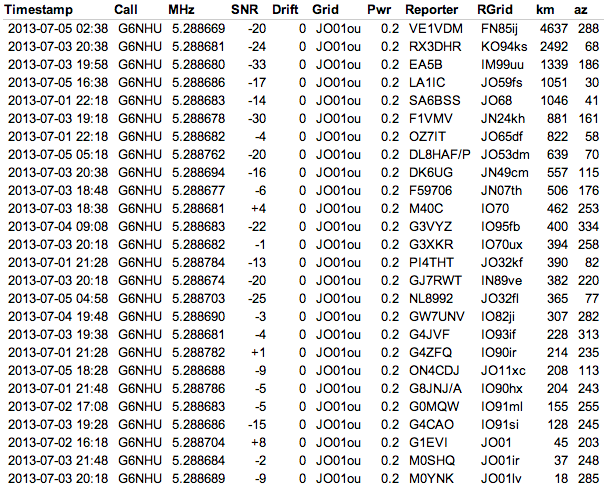 I’ve also been seen by a few more stations on WSPR as well including VE1VDM. This entry was posted in Amateur radio, HF, QRSS, WSPR and tagged 60m, Hans Summers, QRSS, WSPR. Bookmark the permalink.